February | 2008 | rocket ship go! 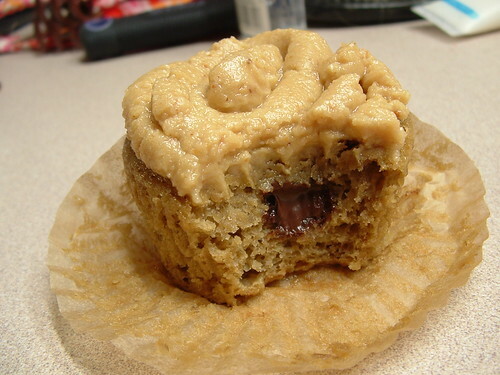 It’s a banana cupcake with peanut butter frosting, from VCTOTW. And chocolate chips, because I’ve been craving the peanut butter-chocolate-banana combo like none other. I’m pretty sure I bought the exact kind of pb they said not to in the buttercream recipe. It’s supposed to be smooth and stable; I got the slightly gritty “natural” kind that separates really easy. As a result, the frosting texture is a little off (although the flavor rocks). The majority of the jar of pb I bought is going towards personal consumption, not cupcakes, so I’ll do whatever I want! The flavor of natural pb is so much better: so rich and savory, and it’s gratifying to look at the ingredients and just see “peanuts, salt.” Very minimalist. 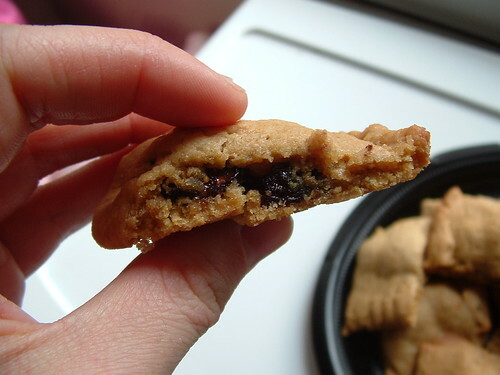 I adore fig newtons, but they’re not vegan (whey that was probably sprinkled in for no reason! ), so I haven’t eaten them as of late. 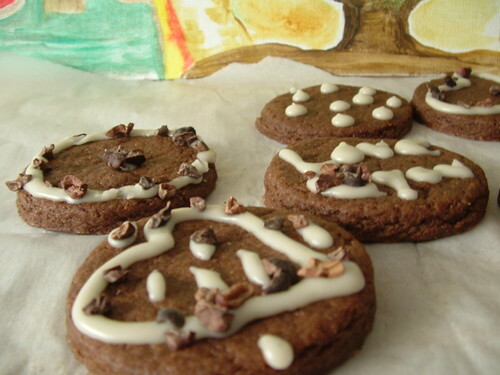 When I read that there is actually a recipe for making your own in Vegan with a Vengeance, I scurried to make a copy of it out of my friend Kyle’s book and set to bakin’. It made me remember how very tasty dried figs are. Unfortunately, there were a couple mishaps. For one, I’m pretty sure I used too many figs, because there was a ton of filling left over, and it didn’t break down and get all mushy like fig newtons should be because the water-fig ratio was off. That means lumpy, chunky, chewy filling. Oh poo. Secondly, the book said to roll out half the dough, cut it into three strips, then repeat, then use three dough strips to cover the other three (filled) strips. I thought it would be hard to maneuver becuase my dough was so sticky, so I used the technique that Kris used, which was dividing the dough into three portions, rolling them out, then filling one half and folding the other over, and pressing to seal the dough. I don’t think I mastered the technique very well, though, because all the lumpy filling got pushed to one side of the cookies. The cookie part is definitely awesome on its own, but it’s not what I was going for. On the bright side, I reduced the fat by subbing the margarine in the recipe with soy yogurt. It still has non-hydrogenated organic shortening in it, which seems pretty essential to hold the chilled dough together and keep it from being too terribly sticky when you’re trying to roll it out. And it makes them brown really nicely. 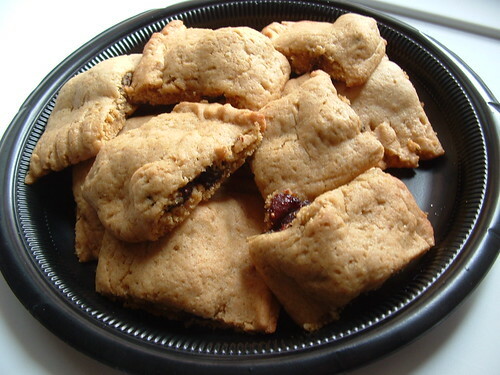 I also used whole wheat pastry flour, but I think the recipe would be best with 100% stone-ground whole wheat or some other coarse flour, just because the whole wheat fig newtons were my faves. So the recipe needs finessing and takes a bit of time to come together, but I really like the novelty of making my own fig newtons. DIY or die, right? 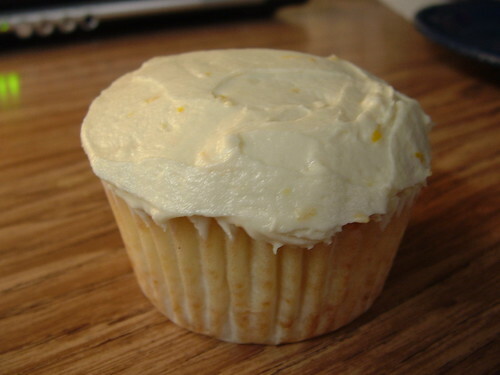 With lemon buttercream, a la Vegan Cupcakes Take Over the World. Sorry for the boring pic, y’all. The buttercream follows the book to a tee, but the cupcake recipe is the Golden Vanilla Cupcake recipe with 1 T. of lemon zest added. Also, I used 1 T. canola oil and subbed the rest of the fat with soy yogurt. I love it so much; it tastes like home. 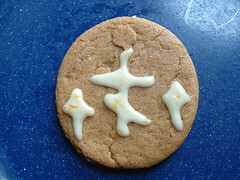 I did get pictures of the gingerbread cookies that I made for OCF. 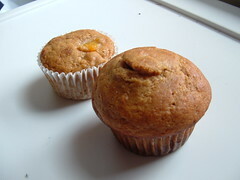 The recipe is really great: if you don’t overbake them, they’re nice and soft, and the spicing is just perfect. I made an orange icing to go with them: 1 c. powdered sugar, 1 t. orange zest, and just enough orange juice to make it gooey enough to pipe from a plastic baggy. In a large bowl beat together oil and sugar for about 3 minutes. Add molasses and soymilk. The molasses and soymilk won’t really blend with the oil but that’s ok. In a sepearte bowl, sift together all the other ingredients. Add the dry ingredients to the wet in batches. Mix together with a firm spoon or spatula until well combined. You should have a pretty stiff dough. Flatten the dough into a disk, wrap in plastic wrap and chill for an hour or up to 3 days in advance. (If you chill longer than an hour you may want to let it sit for 10 minutes to loosen up a bit before proceeding). On a floured surface roll you dough out to a little less than 1/4 inch thick. You can do this in 2 batches if you don’t have the space. Cut out your shapes with your cookie cutters and gently place on cookie sheets. Bake for 8 minutes. I have recently fallen in love with brown sugar. I used them to make raspberry choco chip blondies recently, wondering if it would add anything to the dessert, and it so freakin’ did. It reminded me of the chocolate chip cookies my mom used to make, becuase she always used brown sugar in them. I haven’t used it much lately, because I’ve just been sticking to organic evaporated cane juice. But I recently bought some organic brown sugar, and it’s like the taste of home in your mouth. 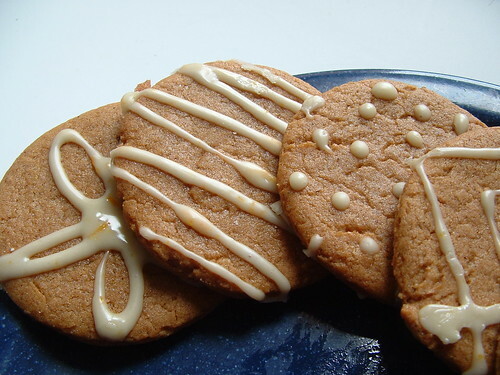 That’s why I was really enthusiastic about making this recipe from Vegan YumYum: any recipe capitolizing on the glory of brown sugar is a winner with me. However, they only have 1/2 c. of brown sugar in them (as well as some sprinkled on top), so the presence was pretty faint. I like them though. 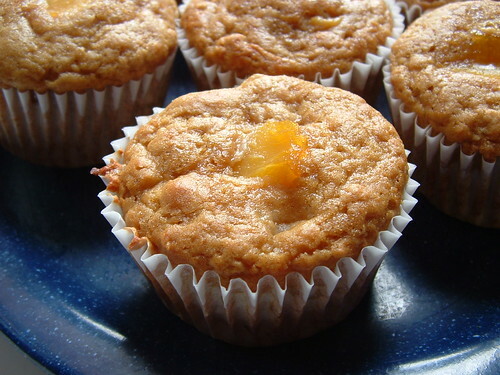 They’re not real sweet (depending on how much sugar you sprinkle on top), kind of the level of a sweet corn muffin, and reminiscent of a pancakes. I like pancakes. Line your muffin tin with 12 muffin cups. Sift the dry ingredients together. The little one looks so scared!